Military discount programs are a terrific way for families to serve, save, and enjoy, and at MyMilitarySavings.com, we’re committed to bringing you the most up-to-the-minute offers from retailers and manufacturers to help maximize your dollar. In fact, we’ve been the go-to source for outstanding savings since our founding in 2011, and we remain focused on helping military families find discount opportunities through coupons, discounts, special offers, and more. Plus, when you join MyMilitarySavings.com, you’ll enjoy more than just incredible savings. You’ll also have the opportunity to make new friends, find support, and get valuable advice from our more than 70 thousand members. We feature blogs written by military spouses, delicious recipes, craft ideas, and much more. We even have active Facebook and Pinterest pages giving you even more access to our numerous benefits. 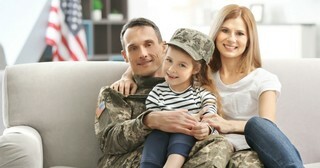 To learn more about the numerous military discount offers that you will find at MyMilitarySavings.com, join us today. Follow this link to our sign-up page, and begin enjoying all the benefits that come with your free membership.